My love for breakfast – at any time of day – is well known. As is my preference for good, simple food. And while I occasionally use my waffle iron to make hash browns and “s’moreffles” (and stay tuned for the most genius use you’ve ever seen! here it is!! ), I mostly use it to make straight up waffles. I’ve got a lovely recipe for you all today – and the best part is that there’s no buttermilk (which I never have on-hand), and no separating eggs! Not to malign either of these steps, but I think the reason I never made waffles more often was that a) I never had the buttermilk, and b) separating eggs on a weekday morning? Ain’t nobody got time for that. This recipe is quick (one bowl), simple and results in delicious waffles every time. Pre-heat your oven to 275 and line a baking sheet (or two) with a wire cooling rack. Have it nearby as your waffles finish cooking. The rack keeps the waffles elevated so the bottoms don’t get soggy; the oven keeps the waffles warm and crisp while you’re cooking up the rest of the batter. Then, when the waffles are finished cooking, flip them over onto the wire rack. I wish I could remember where I saw this tip. See, the bottom half of the waffle is slightly heavier than the top. 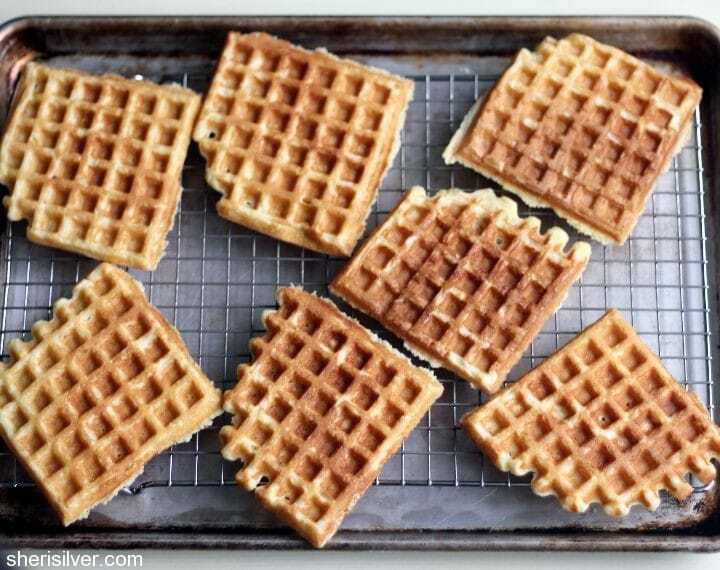 When you invert the waffle it settles so that the texture is perfectly even throughout. Game. Changer. And best of all? 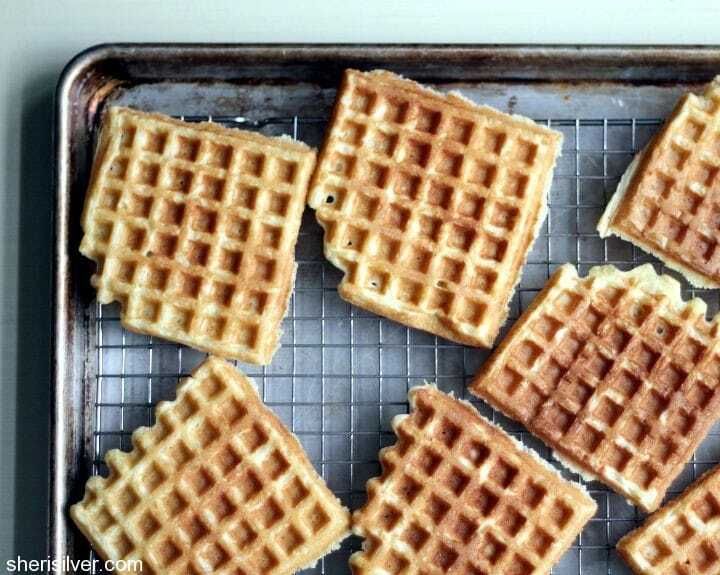 Waffles freeze beautifully – place cooled waffles on a baking sheet and freeze. Wrap individually and pop (still frozen) in the toaster oven to re-heat. Any tips or tricks you’d like to add? Share ’em here! Pre-heat waffle iron. Line one or two baking sheets with wire cooling racks; set aside. Pre-heat oven to 275. Using a stand or hand-held mixer, beat eggs till fluffy. Add remaining ingredients and beat just till smooth (do not overbeat). Spray waffle iron with non-stick cooking spray. Pour batter onto iron, using a large angled spatula to spread evenly, and leaving a 1/2″ border on all sides. Cook till waffles are golden brown. Use the (cleaned) spatula to remove the waffles and invert onto your cooling rack. Place cooked waffles in pre-heated oven to keep warm, and repeat with remaining batter.